Server - receives clients’ requests and replies to them. Client - bundled with the operating system of a client computer or other IP capable device and which sends configuration requests to the server. Note that the initial discover is sent to the broadcast address of the network. What is this address? (255.255.255.255). ANY and ALL dhcp servers will respond. O = unicast, R=broadcast, A = unicast. Server stores that ip and responds with an ack… other dhcp servers will also receive that and realize client doens’t want their address. Server expects client to respond at 50% of lease time, if that fails, it waits to 87.5% of lease time. 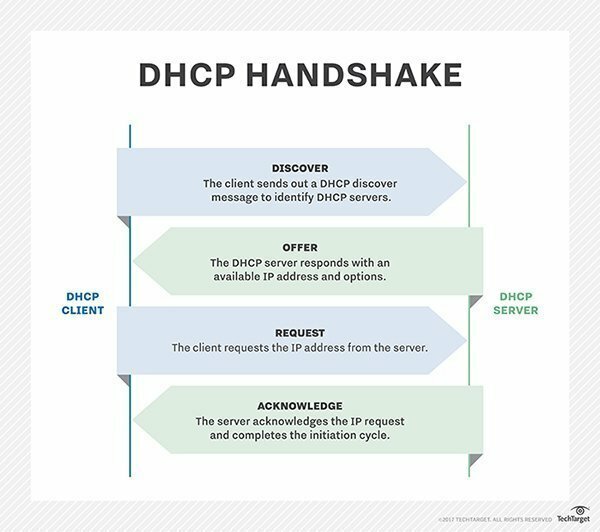 If the client fails to renew its lease after 87.5 percent of the lease has expired, the DHCP lease generation process starts over again, with a DHCP client broadcasting a DHCPDISCOVER. Every time a client device restarts within the lease period, it contacts the configured default gateway. If the gateway does not respond, the client considers itself to be on a new subnet and enters the discovery phase. Clients will redo DORA when they detect they are on a new network. Use case? Laptops, hosts that change frequently? Fixed: Does not change. Admin configures the address on dhcp server. Host checks out (leases) from the dhcp server. DNS expects known ip addresses. DHCP can cause IP addresses to change. How to make sure DNS records are the ones that DHCP has served out? DNS dynamic update: dhcp will make modifications to your DNS entries. DHCP is used with IPv6… but it works a little differently. client1 and client 2 to become fixed clients. Create new windows host to be dynamic client. If you clone a vm (bionic) and get a dynamic dhcp address, you might have the same machines negotiating for the same address. Check the /etc/machine-id on each machine. if they are the same, you have a problem. To fix, you should delete that file and then run: sudo dbus-uuidgen --ensure=/etc/machine-id. Then sudo netplan apply. Then check to make sure that the machine-id’s are unique.